Like most organisations within the Aerospace or Defence sectors we take Quality Assurance very seriously here at Oracle, our Quality philosophy is ingrained in everything we do at Oracle and our staff are fully involved, trained and experienced in ensuring we constantly work to or exceed the high standards demanded by ourselves and our customers. We don’t simply operate a Quality Management System (QMS), our whole business is driven by it. We are proud of our track record of sourcing and supplying quality compliant parts, spares, sub-assemblies and components to our many customers. We are proud to confirm that our QMS meets all the requirements of ISO 9001:2015 & AS9120B (EN9210:2018) and has been independently Certified by BSi to do so. Our QMS is ISO 9001:2015 & AS9120B (EN9120:2018) compliant and audited and certified by BSi. Oracle Components QMS Certification covers both ISO 9001 and AS9120 as we are set up to support every kind of business which needs a secure quality customer driven supply chain partner. For those who don’t know ISO 9001 certification is well established around the world as an invaluable method to improve, measure and assess management processes of the QMS of every size and shape of organisation. Our QMS has full senior management support, encompasses our entire organisation and drives our continuous improvement objectives and ensures customer satisfaction. AS9120 is based on ISO 9001 and is a company level international QMS specifically written by the aerospace industry, aimed at assuring customer satisfaction. 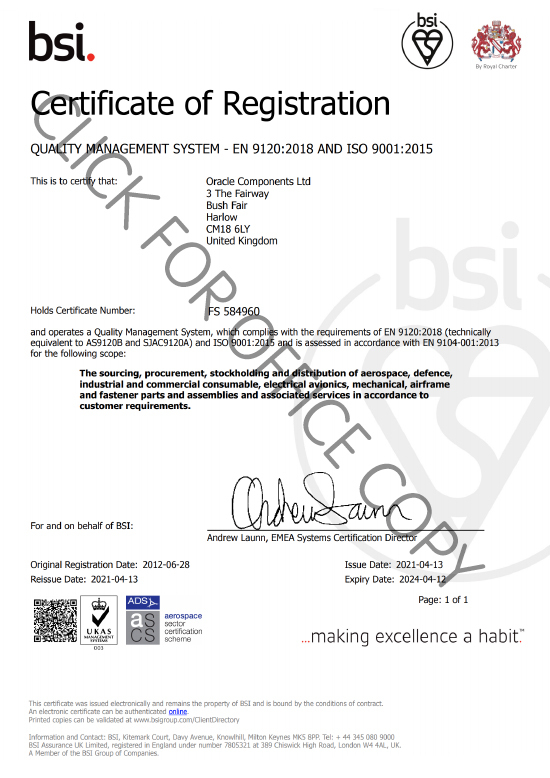 AS9120 is a ‘Quality Management System – Requirements for Aviation, Space and Defence Distributors’ and takes ISO 9001 up a few levels to ensure that customers in these sectors can be assured that Oracle Components is focused and capable of satisfying their additional demanding quality requirements. Aviation, Space and Defence organisations must produce, and continually improve, safe, reliable products that meet or exceed customer and applicable statutory and regulatory requirements. Oracle Components take on the challenge of purchasing products from manufactures and distributors from throughout the world and at all levels of the supply chain which meet or exceed these requirements. Oracle Components is able to rise to the challenge of delivering products to customers having varying quality expectations and requirements, ranging from the Commercial, through Industrial, Aviation, Defence and the Space sectors. What are we certified for? Certified Scope: The sourcing, procurement, stockholding and distribution of aerospace, defence, industrial and commercial consumables, electrical, avionics, mechanical, airframe and fastener parts and assemblies and associated services in accordance to customer requirements. Cyber Essentials is a UK Government, National Cyber Security Centre backed scheme which identifies fundamental technical security controls that an organisation needs to have in place to defend against internet-borne threats. Oracle’s IT Systems have been assessed as meeting or exceeding these controls and are Cyber Essentials Certified. JOSCAR is an accreditation system for suppliers that operate in the Aerospace, Defence, Security and Space sectors. JOSCAR accreditation is valued by and enables registered prime contractors and others to confidently trade with Oracle Components as a pre-qualified and approved supplier. To attain accreditation, Oracle Components was assessed across a wide range of appropriate business parameters including our policy on counterfeit materials, insurance and third-party QMS certification, health and safety, environmental and sustainability, financial history, IT security, corporate social responsibility, anti-bribery and corruption. We are pleased that we have satisfied the requirements to become fully compliant on the JOSCAR supplied accreditation register. Becoming a member assures our clients and partners that the service we provide is of the highest quality and comply with the industry standards. Oracle Components are Registered members of Exostar. Exostar provides a Supply Chain Platform solution for the leading Aerospace and Defence companies from around the world. Exostar facilitates the processing and management of complex or high volume contracts and orders. Oracle Components membership means we are accessible and easier to work with as Exostar is well understood and used by Government agencies and prime contractors alike.